A far poorer than expected November jobs report helped curb what had been rapidly rising bullish sentiment on Wall Street. While stocks edged up for the day, some investors credited the gains to expectations that the Fed will take further steps to boost the economy. Still, investors should put the admittedly sour jobs report in more perspective even though there is no shortage of commentators jumping to conclusions. Some have gone as far as to declare the report as a watershed moment on the jobs front and a terrible blow to the Obama administration, for example. But a look at the market backdrop in comparison with prior recessions shows that the data hardly torpedo the mounting evidence that the economic recovery is gaining momentum. For starters, investors should note that the November jobs data came in a month that saw major swoons in the stock market. The S&P 500 index started a 4% slide on Nov. 5 that wouldn't reverse until almost two weeks later. Fed officials have previously said that the stock market has a major effect on confidence broadly. Chairman Ben Bernanke noted the impact that a rising stock market can have when laying out his case for the latest stimulus round, and just last week, former chairman Alan Greenspan again argued that rising stock markets are the key to an economic recovery. The so-called "wealth effect," in which rising equity prices boost the net worth of households is the most frequently cited mechanism for explaining why a rallying market helps the economy. More disposable income can help generate overall demand, after all. A steadily lifting stock market, though, could also serve as a cue to employers that business conditions are stabilizing. And that's likely to play a key roll in generating the type of confidence required to take on major new commitments, like full-time employees. Indeed, blockbuster job gains in October, which blew by all estimates, followed a months-long market rally. And that was also true for the strong spell of job creation earlier in the spring, before market turbulence and a hiring hiatus set in. Employer anxiety about a tumbling market may have dampened job creation again in November. As the European debt crisis that caused so much consternation over the summer resurfaced – indeed, Ireland is a bigger issue than Greece – it's reasonable to expect employers to be less inclined to hire. A wait-and-see approach, after all, is an understandable reaction in the face of a brewing financial crisis that could spin out of control. A more sober-minded assessment by investors would reveal a surprisingly strong recovery even when the latest disappointing job figures are taken into account. Analysts at Ned Davis Research tabulated employment across industries following the November data and compared the current recovery to two prior recessions. "To put the trend in perspective, private payrolls are tracking slightly better than the 1991 expansion and much better than the 2001 expansion," Ned Davis research wrote in a note to clients last week. Employment in the financial sector is at 12-year lows, while mining jobs growth is growing at its fastest pace since 1982. 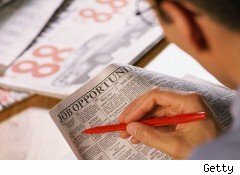 Investors are likely to be bombarded with declarations of a jobless recovery following November's results. But they should factor in the month's market turbulence as well. Even though the U.S. is digging itself out of a much deeper hole this time around, the progress has actually been relatively strong compared to the last two downturns.